Dr. Michael Rachlis told the CBC’s The Current that it was like Groundhog Day all over again. Discussing the latest CD Howe Institute Report “Chronic Healthcare Spending Disease,” Rachlis and Diane Gibson, Research Director of the Parkland Institute, took issue with the gloomy scenarios painted by former Bank of Canada Governor David Dodge and Richard Dion, a Senior Business Advisor with the law firm Bennett Jones. Dodge, in an interview earlier with the CBC, had said health care costs were rising faster than growth in the economy due to advances in technology, a demographic shift, and prices and wages rising. He said it was his “hunch” that all four of the scenarios would be implemented to some degree. Rachlis questioned why the authors of the report used data from 2009 to support their argument instead of 2010. Rachlis says that according to the data, health care spending as a percentage of our overall economy went down (from 11.9 per cent to 11.7 per cent) and that the cost curve will continue to decline over the next three years. He called Dodge “factually wrong,” stating the CD Howe Institute authors chose to draw their figures from the deepest year of recession. When the economy shrinks, as it did in 2009, it makes health care spending look larger. In fact, he said, health care recorded one of its lowest levels of growth in 2009. “I don’t know why a report in April does not have data from 2010,” he told the CBC. Rachlis said costs were in decline in part of because brand name pharmaceuticals have levelled off in price with the expansion of generic drugs. Drugs have been among the fastest rising category within health care. She highlighted how the costs of vision care increased 17 per cent after being de-insured, and how the Canadian Centre for Policy Alternatives estimated $10.7 billion could be saved through a national pharmaceutical plan. Frustrated with the “the same stupid debate,” Rachlis said there were numerous examples of how we could improve our system, but we never hear about them. Rachlis and Gibson also argued that the silver tsunami doesn’t really exist – that increased costs due to aging are averaging less than one per cent per year, well within normal levels of economic growth. Dodge had told the CBC that costs would likely rise to 18 per cent of our economy by 2020. Even with better efficiencies and improvements to the system, he said it would only slow it down to 15 per cent. The problem is the data just doesn’t support that scenario. 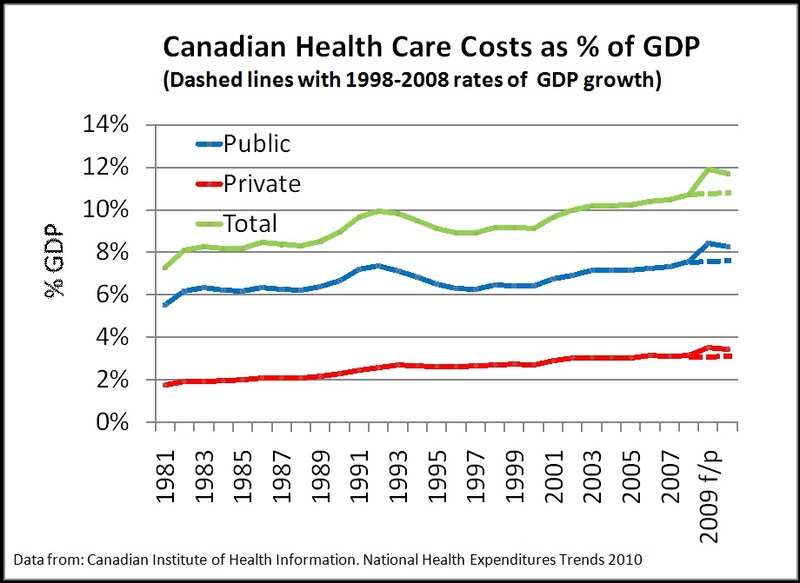 He claimed that we don’t really have universal health care now, since 30 per cent of health care spending is private. He said the discussion should really be about where the borders between public and private health care should be. This entry was posted in Health System and tagged CBC, Dodge, Gibson, health care, Parkland, public funding, Rachlis, Rachlis Dodge health care privatization Parkland Institute, Sustainability. Bookmark the permalink.